Are you looking for a tea shop in Granada? In Medievo that has a personalized treatment with its customers and where you find a wide variety of teas, the most exotic mixtures of them, coffees, infusions and delicatessen products? Then you have come to the right place. Medievo Granada, the taste of Granada. Medieval Granada are many things at once. It is your shop specializing in teas, a well-known tea shop frequented in Granada, the best in the city, where you will have a variety of teas, both known and unknown, that will delight your palate. Along with teas, you can also purchase all the necessary accessories to prepare a good tea at home and to family and friends with a cup of premium tea. If you are passionate about the Arab and Moroccan world, if you like to surround yourself with Arab art and your house is decorated with Arabic decoration, do not hesitate to take a look at Medievo Granada, your reference shop in the Arab world and in the world of tea . We have been dedicated several years to the sale of Arab teas and products. We have made a hole in Granada and now we are a reference company in the city. There are many who come to our stores to buy tea, buy coffee or get advice on Moroccan products being attended at all times by qualified personnel. And now, online you will also be able to enjoy this service to buy quality tea and products that will evoke another era. 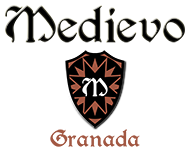 Do not hesitate, Granada is the spell of Spain, and Medievo Granada products have imbued that mystery to surprise you with every sip or look. What you will find in Medievo Granada? Medievo Granada sells both physically and through the internet, guaranteeing a delivery in 24-48 hours, except weekends and holidays. We can sell to Spain and other countries, managing the shipping costs with the latter. In our Medievo Granada teas shop you will be able to find special teas, curious teas such as blue tea, red tea, sencha tea, etc . ; coffees of the best possible mix, infusions that will help you with ailments, incenses to relax at home, delicatessen products for that most refined palate (you have to try our recommendations, like Granada honey, Granada wines, Granada beers, artisan chocolates, and many more products that will make your mouth water), accessories to enjoy a tea ceremony in your own home and more. The only way to get to know him is to visit us in our tea shops or in the store of Moroccan products that we have. Where you can find this shops? If you are not from Granada or you can not travel to the city to buy quality tea, you do not have to worry because Medievo Granada comes to you. You already know the saying: “If the Mountain does not go to Mahomah, Mahomah will go to the Mountain”. That’s how we are in Medievo Granada. On our website you can buy all the products you like and buy them with all the guarantees we can offer you. We are always adding new products and creating offers that may interest you so do not stop looking. All orders will arrive within 24-48 hours properly packaged so that they retain their properties at 100%. Once you try us, you will repeat because you will not find another place to buy tea that resembles Medievo Granada, the best quality products always for your home.